Our Facility - K.A.M. Trucking Inc.
K.A.M. maintains a 6400sq. 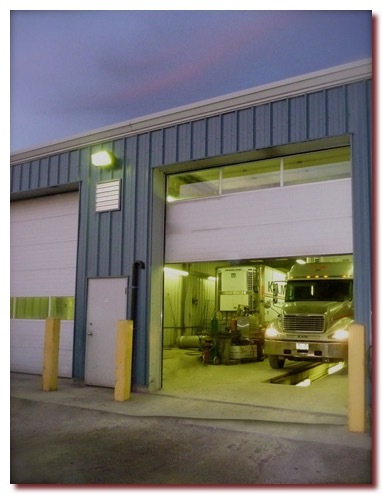 foot maintenance facility in Wainfleet that is equipped with two full length drive through service bays, a service pit, and two tractor bays. Our shop is operational 7 days a week, with staff operating two shifts throughout the weekdays, and a day shift on the weekends. We do all of our repairs and maintenance in house, with the exception of any major engine work. K.A.M. stocks an extensive parts inventory for our late-model Freightliners, which ensures that we’ll always have what we need to keep our equipment running safely and efficiently. In an effort to ensure minimal equipment downtime and exemplary service, we run every outbound tractor trailer combination across our service pit over the course of the weekends, looking for defects, and performing preventative maintenance. This is a key reason why we are consistently punctual for our delivery and pick-up appointments. We are able to keep on top of, and correct the small problems, before they lead to the major issues that cause on road failure, and hence missed appointments. Our drop yard is large enough to accommodate all of the equipment in the fleet ,with room for any overflow that may arise from rented or borrowed trailers. Refrigerated loads are checked and fuelled regularly while on site, to ensure we have no issues, and that your shipment remains at the requested set-point while in our care.